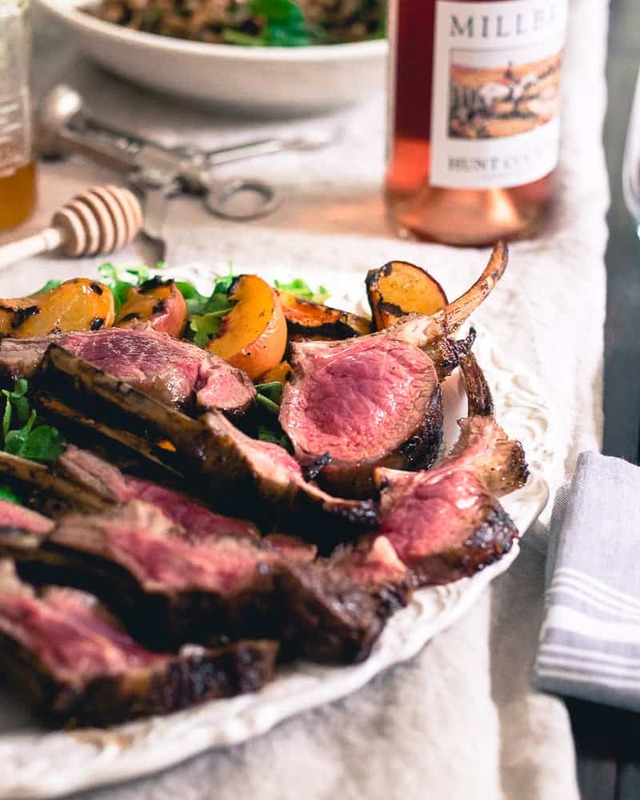 These grilled lamb chops are glazed with sweet peach honey and served with a simple watercress and grilled peach salad for the perfect summer meal. 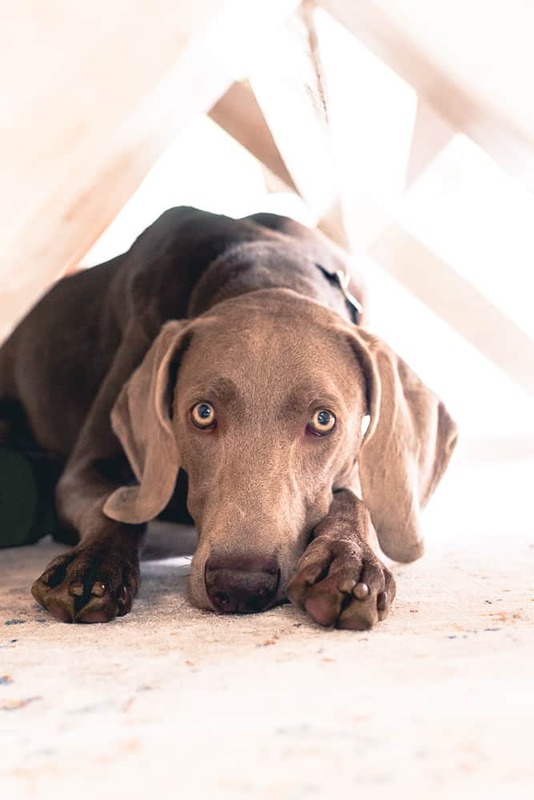 *This post is in partnership with the American Lamb Board. All content and opinions are my own. If you were in my house exactly 2 months ago, the whole first floor would look almost entirely different. What happened was a snowball effect of selling almost every item I own in my dining room and office, changing out all the hardware on our doors (including every-single-hinge), 4 new light fixtures, spray painting curtain rods, hanging new curtains, 2 new rugs, installing an interior French door and painting almost all of the house. It’s been a whirlwind 2 months (once I get going with stuff like this there’s no stopping me) and I’m about 90% with just a few finishing touches left. For now, at least. With my mother-in-law visiting, my husband home (he’s gone M-F through September for work) and friends willing to bring pie, I decided it was the perfect time to give the new dining room farm table (a great find on Facebook marketplace!) a spin with some delicious summer inspired American Lamb grilled lamb chops. And with peach season (the BEST time of year!) here, the menu took shape easily. I’ve had a jar of peach honey from one of my favorite local honey stores in my pantry for months. I savor it by drizzling just the slightest amount on toasted bread with nut butter or a rice cake for an afternoon snack trying to make it last as long as possible but these beautiful American Lamb rib chops (find them in Whole Foods) deserved a bit more than a drizzle. 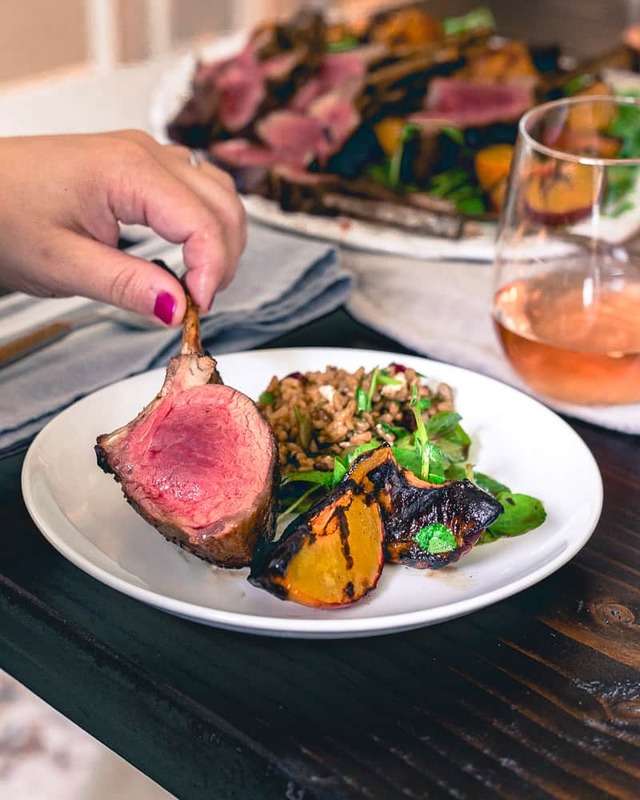 I glazed the rack of lamb on the grill with the peach honey and what resulted was a perfectly cooked medium-rare chop with a charred, sweet, floral peach crunchy exterior. They were kind of outrageous. In that good sort of way where you don’t want the meal to end. 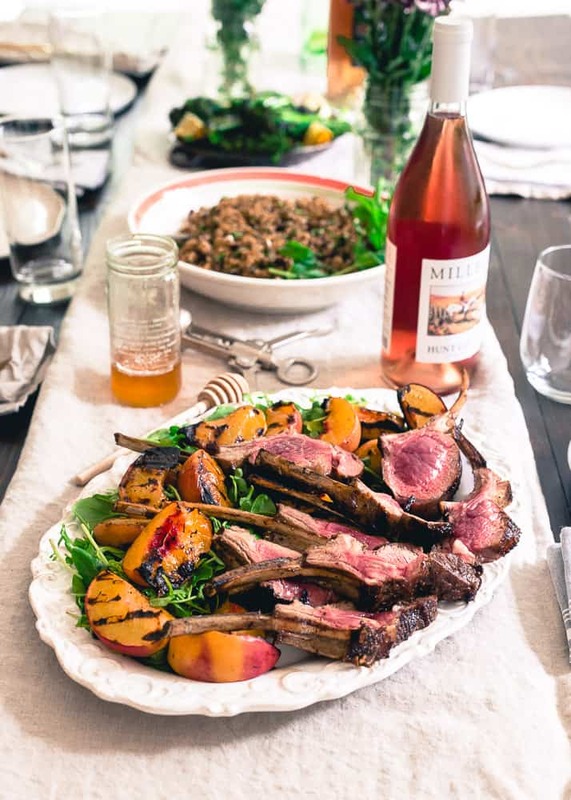 Grilled peaches on top of a simply dressed watercress salad were served alongside the lamb chops and I made a simple brown and wild rice salad (studded with things like feta, fresh herbs, dried cranberries, seeds and nuts) and some grilled baby broccoli to fill up the table. 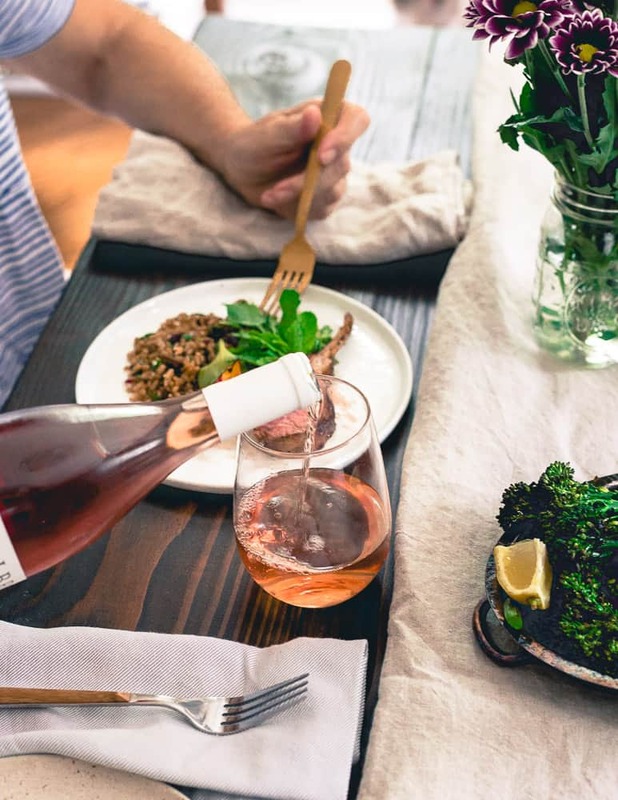 We poured a local rosé to match the local honey and American raised lamb and fended off attempts from a certain someone to grab any scraps that might come her way in her strategic spot under the table. I’m still waiting on the new dining room chairs to be delivered, art work to be hung, more plants to be purchased (on a total houseplant kick, macrame and all lately) but the meal and the grilled lamb chops in particular were still perfect and the peach, blueberry, cherry pie that followed from a local orchard store the best I’ve ever had. I mean seriously, it’s like all the best summer fruits in one. 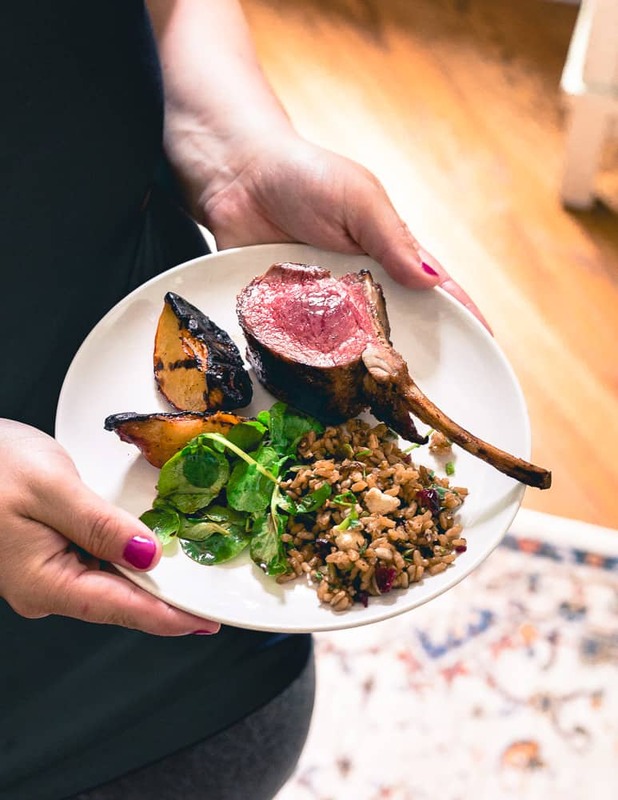 The grill brought this meal to life, made the whole thing super easy and let the flavor of the delicious and versatile American lamb shine through for a summer evening I’ll remember long after the next wave of home renovations takes hold. 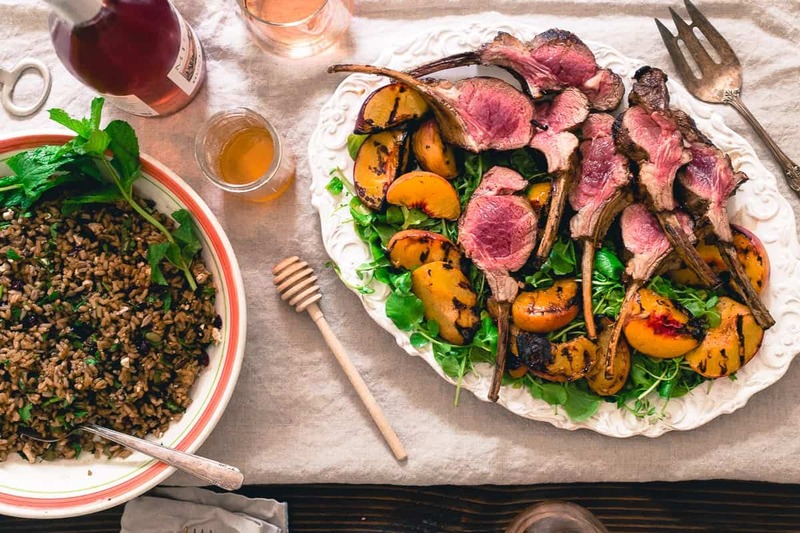 Love this Grilled Lamb Chops recipe? And if you want an equally delicious lamb recipe a bit more suited for fall, try these apple cider braised lamb shanks – so good! Preheat outdoor grill to high. Season the trimmed lamb chops liberally with salt and pepper on both sides. 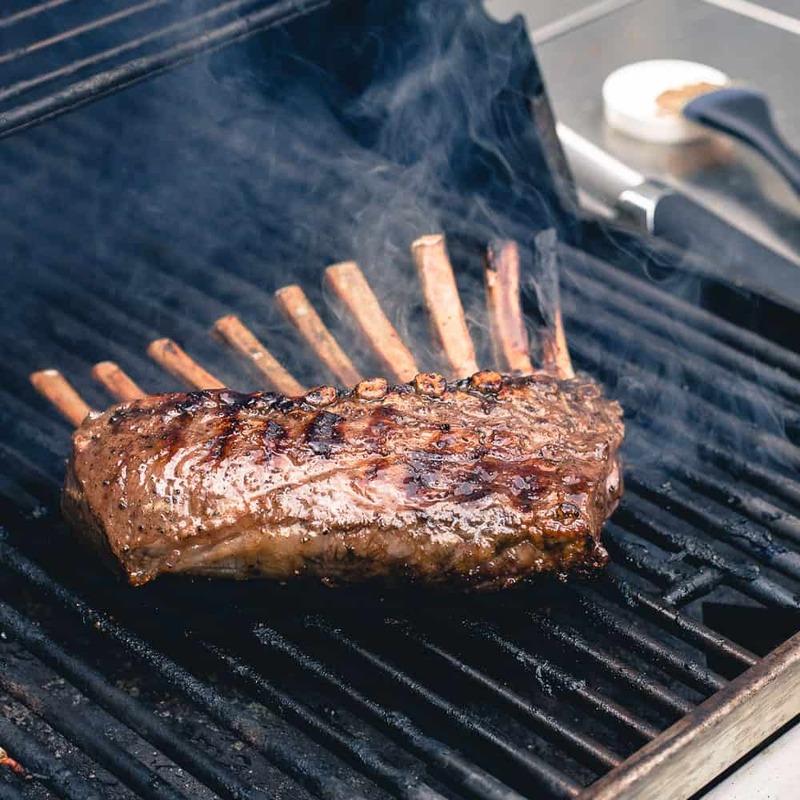 Place the rack of lamb directly on the preheated grill and let cook until browned and dark grill marks appear on the bottom. 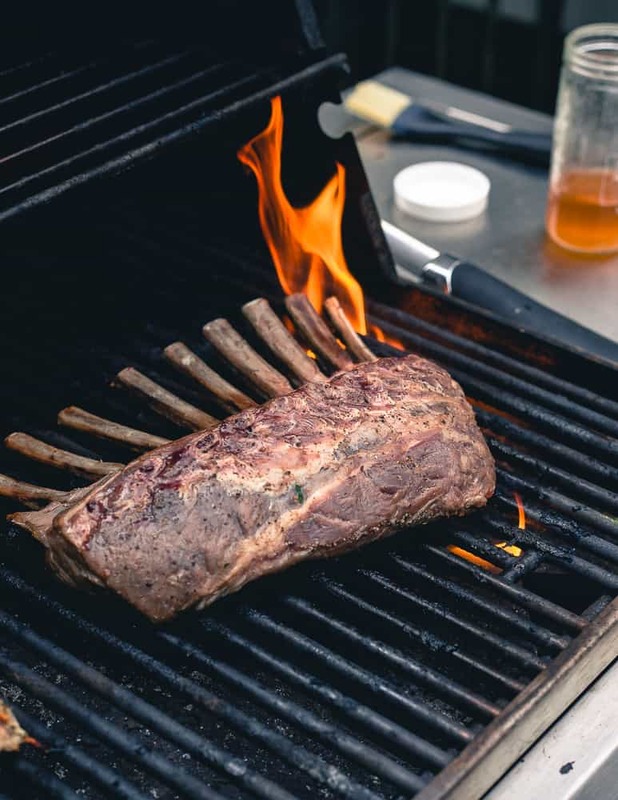 Flip the rack of lamb and grill on the other side until equally browned. 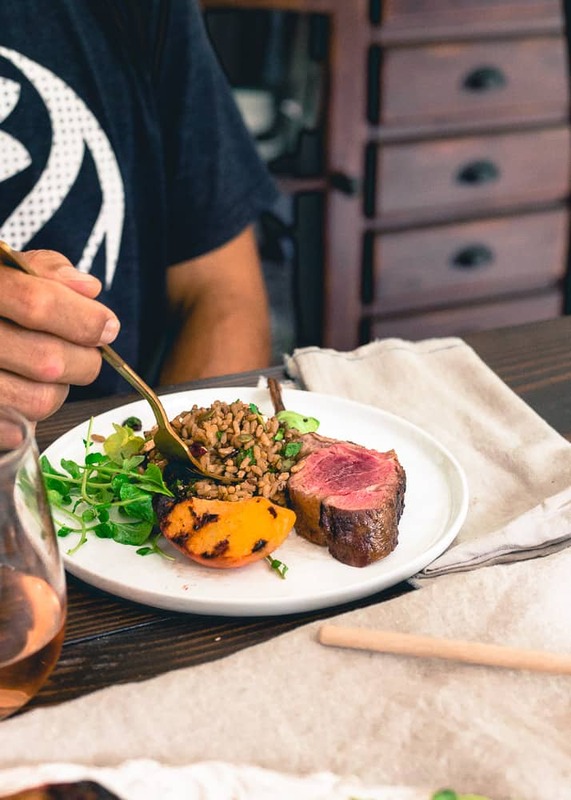 Brush half the peach honey on the rack of lamb. Close the grill and let cook an additional 2 minutes. Flip and brush the other side with the remaining honey. Leave the lamb on the grill until desired doneness. 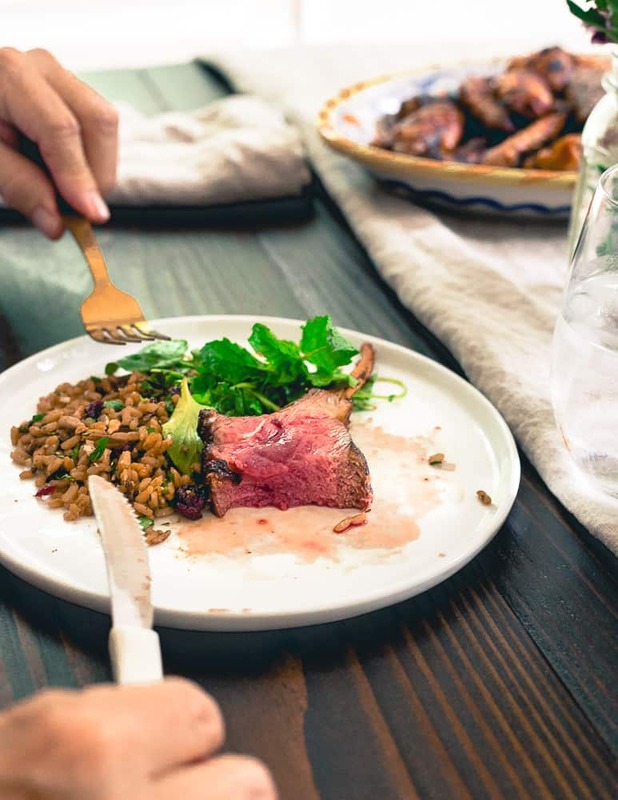 Medium-rare should be golden brown with deep char marks on the outside and taken off the grill with an internal temperature of 135°F (the temperature will continue to rise and meat will continue to cook after it's off the grill). Let the lamb rest on a cutting board for 5-10 minutes covered with aluminum foil. Slice and plate with the salad before serving. Place watercress in a large bowl. Add 1 tablespoon of the olive oil, lemon juice, salt and pepper to taste to the bowl and toss to combine. Place the salad on a large serving platter. Drizzle the quartered peaches with the remaining tablespoon of olive oil and season lightly with salt and pepper. Place peaches directly on preheated grill. 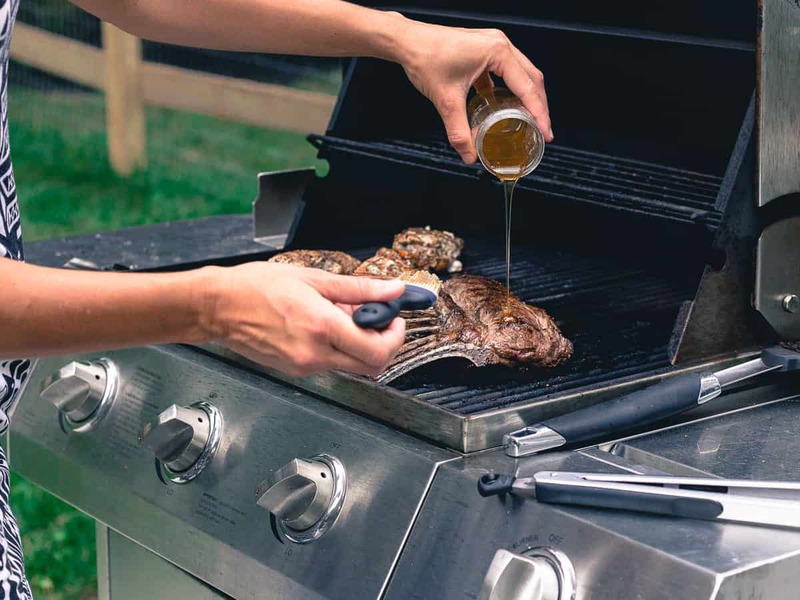 Grill for about 2-3 minutes per side until dark grill marks appear. Remove peaches from grill and place on top of the platted watercress. Serve alongside grill lamb chops. Perfect cooked! A good grill is a miracle in our life! Looking delicious! Wow! These look absolutely amazing. I’m not really much of a griller, but I might request these next time my boyfriend grills! I love the sound of the peach with the lamb. I bet they compliment each other really well. I love this kind of summer meal! Lamb is such an underused and under rated meat.